The 10 Best Places for Fried Chicken in California! Nothing is better than perfectly fried chicken. Sweet or savory, Southern or Asian-style, you can find amazing fried chicken joints throughout the state, many of which are world famous for the ability make crispy skin with juicy meat. 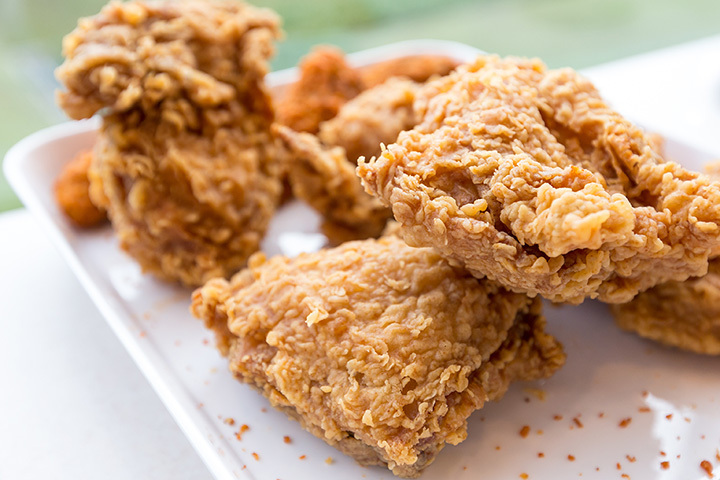 Check out some of the best places to have fried chicken in the Golden State! Roscoe’s House of Chicken & Waffles has fans from all walks of life, from former presidents to hip hop legends to locals that just really like the pairing of sweet waffle syrup with hot sauce and perfectly fried chicken. Sandra Dee’s has great barbecue, but the fried chicken wings are even better. Not too much batter and just the right amount of spice mix makes Sandra Dee’s one of the best places to enjoy fried chicken. Get plenty of chicken to go with the delicious sides, like collard greens and mac and cheese. Thomas Keller doesn’t just do fine dining well, he does everything well. Which is why the fried chicken at his casual Ad Hoc space has become world famous. It’s like you make at home, except for even better. Head to Ad Hoc for the Sunday brunch that includes a gourmet waffle paired with buttermilk fried chicken. Once upon a time, Pioneer Chicken locations could be found throughout the greater LA area, in between other fast-food fried chicken options. Now only two locations remain but die-hard fans still flock to the drive-thru window for a combo meal of fried chicken and sides. Honey’s Kettle Fried Chicken is rumored to be as addictive as a drug because you really only need one bite of the stuff to get hooked. The sides are good too, but the main star really is fried chicken like you’ve never had before. It’s perfect for a quick bite on the way to or from LAX. Brown Sugar Kitchen is comfort food at its finest. Regularly named as one of the best restaurants in the East Bay, Brown Sugar Kitchen is a favorite spot for celebrities, sports stars and food magazines, thanks to fried chicken that is worthy of a road trip according to Los Angeles-based food critic Jonathan Gold. San Tung’s famous for its dry fried chicken. You can add sauces and spices, but be sure to try the original before you get too creative. San Tung regularly has a line lined up around the block to get some Asian styled fried chicken, but rumor has it that you can order the same menu at the San Tung II next door. Dinah’s Fried Chicken is a classic old-school joint that has been serving fried chicken to generations of Angelenos. Still family-owned, Dinah’s promises a unique frying method for super crispy and not too greasy chicken in a bucket or box. BonChon is a Korean fried chicken chain that has sprouted up locations Stateside, including California. BonChon has a slightly different menu in each location but they all offer Korean style fried chicken with your choice of sauce. And pickled sides, fusion dishes and traditional plates as well. Crispy Fried Chicken is a no-frills spot perfect for picking up a quick fried chicken dinner. Made to order, you can find the usual chicken wings, legs, etc., as well as chicken gizzards and livers to go with the multitude of other fried items on the menu.